Hotstar Premium Free Account Trick: Hi! 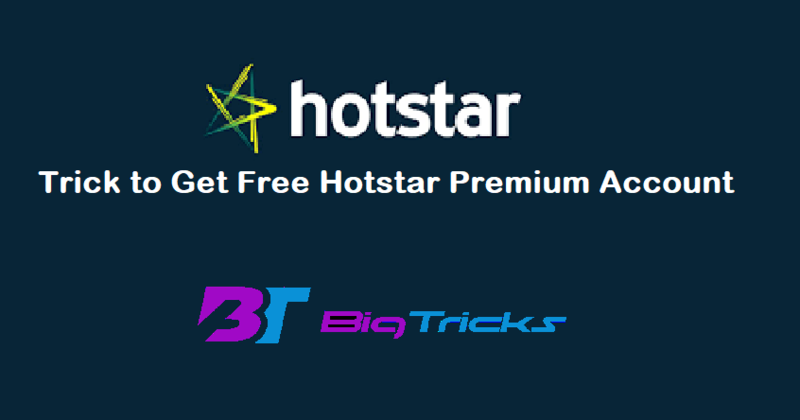 Guys, Welcome to Bigtricks, I Hope You are Enjoying Our Free Loots Here I am back with a New Mind Blowing trick to get Hotstar Premium Account for Just Rs.0 & Watch Hotstar Premium Free, You can AlsobigSay Premium Account For free. These Tricks are Personally Verified by me and I have also uploaded Proof for same. I was Searching for the Hotstar Premium trick from many days because Game Of Thrones is all set to launch its season 8 And to Watch GOT in India Hotstar is the Only Legit Way. You can Watch Latest GOTS07 Uncut at Realtime in India Moreover You can also watch Any Hollywood or American TV Series and Premium Movies after getting Hotstar Premium Account and to do so You just need to follow below trick and at the end, you’ll be able to use Hotstar Premium Account for Rs.0. You Can Also Watch Hotstar Premium Content on Airtel TV, Jio TV & Vodafone Play for Free. So If you don’t have Hotstar Premium. This is also Evergreen Hotstar Premium Trick for you. Latest American Shows Uncut, Ad-free & Minutes after America. Indian TV Shows Latest episodes at 6 AM every day. It Cost rs.199 Per Month For Subscribing Hotstar Premium and there are some other Hotstar premium plans which you can buy. 3. Now Search For the Channel StarPlus or Any Star Channel. 4. Now Make Sure You have Hotstar App Installed, Open The Channel. 5. Now You will be redirected to Hotstar, here You can Watch Live TV. Press Back Button & Now You Can Enjoy Some Premium Features For Free on Hotstar. 6. You Can Watch Live TV Channels, Live Matches for Absolutely No Charge. Airtel Users can Access Hotstar, ZEE5, HOoQ for free with Airtel TV/Vodafone Play. Now Download Airtel TV from Playstore. Open Airtel TV & tap on Explore Premium button at the middle bottom. Here You can search for any Star channel & Open it. Once you open any star Channel, it will be redirected to Hotstar App. Note – You will Require at least Rs.199 Recharge in order to access the services. 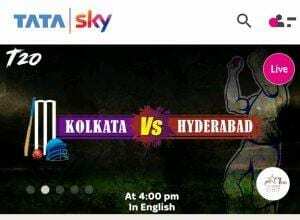 If You have Tatasky or if your relative has Tata Sky Connection then you can watch Premium Star channels or Watch IPL 2019 in your laptop or Hotstar App. You just have to Download Tata Sky App & You can watch all Channels Live. You must have an active tata sky subscription. 2. Now Install the app & Login with your subscriber id or mobile number. 3. Now on the home screen, you can see the banner or search for star gold channel. 4. Now You can watch Star Sports channel on Tata Sky App or website. 5. The channel should be in your plan to watch. You can buy star gold or Star select or Star Sports to your Tata Sky pack. Shop on Flipkart as usual & Get Free Hotstar Premium Subscription. Just Purchase anything above Rs.299 & Get 1 Plus Point & upto Rs.10 coin in an order. You Can also get Viu Free membership for 6 Months & Other Freebies Like Gaana+ Subscription. 1. Hotstar has disabled use of a debit card for the trial purpose. So You can Get Free trial only if you have a Credit card. 2. You Can Cancel The Membership before 7 days & You will Get Total Refund for the paid amount. 3. You can Use HDFC/ICICI Cards for the same purpose. There is two Phase to get the hotstar premium account. In First Phase you need to get your Virtual Credit card. 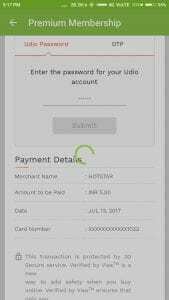 here We will use Udio Wallet to get Free Credit card. Follow Phase 1st To Get virtual card For free. 2. Now Install The App and go For Registration. 3. For registration, you need to enter your mobile number name and other required details. 4. Now Visit Your Profile & Complete The KYC. Now create A new Account Using Facebook or Google+. Now Click on “+” Icon from the Right bottom corner. From Here You Can Generate Your Virtual Prepaid card. Set a 6 Digit Password or OTP to Use it For 3D Secure verification. Done, You Have Got Virtual Card From Which You Gonna Pay Rs.5. Done, Let’s Proceed to Phase-2. Now Install Hotstar App From this link. Install The App And Signup or Login to Your Account. Now You need to Access any Premium Video. Just Search Any Premium Content, You can Search For “How I Met Your Mother“. You will be Asked to Activate Premium membership-Yes Click to Activate Premium. On Next screen – Select Pay By Credit Card And enter Credit Card Details From Phase 1 Of Udio Virtual Card. Now You Will be Redirected to Visa Verification Page, Enter Your OTP or Password Generated in Udio App In Phase 1. Done, after verification, you Will be Charged Rs.5 that Will be Refunded to Your Wallet Within 72 Hours. After Receiving Cash From Hotstar You can transfer it to Your Bank Account In Other words you got Hotstar Premium For free. After 29 days cancel the Subscription if You Don’t Want to Continue. I Hope using This Trick You have Successfully Got Hotstar Premium Account For free This will be Valid for Next 1 Month So After That you can Try Same Procedure for New account and get it Unlimited time. You Just need to create new Hotstar account No Need for a new udio account. If This Trick Worked For You Please Give A Thumbs Up and Share This Post with Your Friends And also help the To Know This Trick. You can Visit Mobdro. if You want to Watch Premium Series for Free. Mobdro has lots of Hollywood series available in the app. You can also stream for free. You can also Download Vidmix App from Xander App Which offers you free Premium Content as well as Paytm cash for referring Your Friends. Here we at Bigtricks are not a Founder of this method. We are not mean to Void any violation of Hotstar. These Methods are Only for Educational Purpose. Try it at your Own Risk. I / Author / Bigtricks is not responsible for any Harm or for Any Violation of Any Party. Other Links like Direct Streaming Links are not generated by us. Can I able to repeat this using different virtual cards in the same hotstar account, or I need to signup with different mail ID ? Signup with different ids no need to verify emails. My Airtel uses the same card for every transaction. Is there any other service that has an option to cancel the card and create a new card ? Now i see adv on tv that star tv is 49 roupies where can I get I am.leaving in.uk. Videoder or Instube or Vidmix app download karo. Uske baad woh app se Hotstar, SonyLiv ka koi bhi premium shows apna device mein download download kar sakte ho. But yeh sare app se live match or live tv ko dekhne nehi milega. Uske liye jiotv toh hai.